After some thought, we have decided to move ABSOLUTION to UC87 (87 Ludlow St @ Delancy) permanently. FONTANAS has very obvious advantages such as being a rock club and having a wonderful staff and atmosphere. But they have a lot going on. When we had to switch venues at 8:30pm the night of the party because of a schedule mixup and UC87 took us no questions asked, we decided to make the change. UC87 is an amazing dance space downstairs and has some advantages like the free parking lot across the street, cool lighting and great staff. We also get to start at normal club hours instead of waiting for bands to get offstage. So, to recap: Just as we had decided to make FONTANAS our home, UC87 saved the day so we decided to make them our permanent home instead. The last party we will have at FONTANAS will be New Years Day. We are holding true to our weekly schedule, and it is slowly building into what a true Gothic nightclub event should be. We were very surprised to see that NYCs Goth/Industrial scene had disintegrated into fragments of nights, such as "first Tuesdays" or "every other Thursdays" or some such. We don't believe that is a proper club event. The truth is, almost anyone could do a monthly or bimonthly event because they are so easy, and such events do not contribute enough to building a proper scene. They are for dilettantes, students or people who are not serious about music and nightlife or do not have time or do not want to make time in their lives to make a proper effort. We are also holding true to pure Gothic/Industrial music and theme. We do not drift toward hipster influenced sounds, number one because the sound is boring and number two because that would not be doing a true Gothic/Industrial night. Not every year produces good Goth/Industrial music, so just keeping up with the latest is not enough in our opinion. Is what you're playing actually entertaining? In addition, we are using intelligent, sophisticated images and not underestimating our audience with childish, grotesque or dumbed-down images and words. One of the most dishonorable things a person can do is use intellectual property belonging to someone else. This is very, very looked down upon by people from all walks of life. Can't you have your own ideas? If someone else has used an event name, it is not acceptable for another promoter to use it later on. As with any artist, originality goes hand in hand with respect. A real artist does not regurgitate things he has seen and heard other artists doing verbatim in a monkey-see, monkey- do fashion. Living with Jason is one of the greatest things that ever happened to me in my life. It's not just because of the obvious reasons. Jason is a sweet, gentle person who is very courteous and respectful. It upsets him to forget Christmas cards and birthdays. He is sensitive to the extreme, and has the ability to deeply care about other people. He is so polite that he won't even walk into a store unless he is intending to buy something, not even to get out of the rain. He hardly swears. He is a true gentleman who displays good sportsmanship and gentility with every move. He is a living treasure. "...I'm so sorry, but there's been a schedule mix-up. There's a Christmas party that has been booked for 3 months which I forgot about when I gave you this date. I'm really sorry..."
This left me exactly three and a half hours to find and book another venue for our weekly party, and get it in shape for our night. Impossible? No Way. The main thing is not to panic. Follow the steps. First, have a back-up plan. I followed my plan and called a venue which has been friendly and reliable to us in the past, UC87@87 Ludlow St. Luckily, they had no regular party booked. We worked out a deal where we would take the upstairs, which was decorated very prettily for Christmas(bonus!). Next, I made sure working DJ equipment would be there, opting to bring my own set-up. Rushing home, I began to edit the website and put the word out about the venue change on the networking sites. I use a site that lets me post to all the networking sites at once. Jason threw the flyer into Photoshop and chopped out the address, and I re-uploaded it to the site, making an annotation about the venue change. I then made phone calls to every staff member and guest with texting and calling circles. 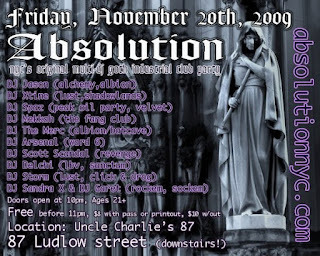 We then loaded the car with the DJ setup and gear we bring to ABSOLUTION and burned rubber down to UC87. I analyzed the new room and performed all the duties which get us ready for guest to arrive. I then got back in the car and went to Fontanas, opting to give up my DJ slot in order to catch people who didn't get the word about the venue change and tell them where we were tonight- luckily only about 5 blocks away in the same section of the city, walking distance. The entire time I was doing all this I felt no tiredness or anxiety, just following the steps that were necessary. But when I got back to UC87 and was sitting comfortably with a drink in hand surrounded by the party, I then almost slumped over from the delayed anxiety reaction of having the venue changed at the last minute. This is often how it works for me, I can perform like an automaton when there is a crisis but when everything is ok again that's when I feel it. UC87 upstairs turned out to be a great place to have a party. They have a mini laser lighting setup which has a beautiful effect on fog, and the space is long and dark with lots of comfortable nooks to sit in, with a dance floor at the end of the space, the DJ booth on a raised platform by the dance floor surrounded by clear glass. I met some great new people who came out for the first time who had a really good time. I had a lot of fun dancing, and the drinks were good for the price and came in large, pretty glasses. Not bad for a quick save. In this business you must be prepared for anything to come your way. When working with people you must keep in mind, they are not perfect. Mistakes will be made, but with quick thinking and experience(and good luck!) all obstacles can be surmounted. We are dedicated to bringing you the best club experience possible, and we thank you for the comradery and support you have shown us in this Holiday season. It seems that ABSOLUTION has come to rest after the 6 week "venue tour" we have gone on, which has been exciting and fun. Patrons have watched us pick up speed as we did one night each at the old Annex(Doghouse Saloon), China 1, Fontanas, Uncle Charlie's 87, and now back to Fontanas. Dizzy? We were, lol! We had a wonderful time, and we received a lot of positive feedback about the various venues. Some seasoned veteran DJs and club patrons gave us their input, and we've decided that Fontanas is a good choice. FONTANAS is a rock club which promotes other branches of the rock n roll tree- punk, metal, etc. They gladly accepted us, a Goth/Industrial night, and treated us well in the process. We will be at FONTANAS for the next two Fridays in a row, starting at 12 Midnight. Coincidentally, it's located at 105 Eldridge St...LOL! Even seasoned promoters like Jason and Myself who have been active for well over 10 years in the Goth/Industrial scene have a hard time changing venues so much. But we decided to take it upon ourselves to do it. Sometimes you have to just "work your way in"...it's like a game of Tetrus. I love thinking "outside the box", and this is a perfect example. A lot of the promoters of old have left NYC because it's much harder to do business here and stay ahead financially. 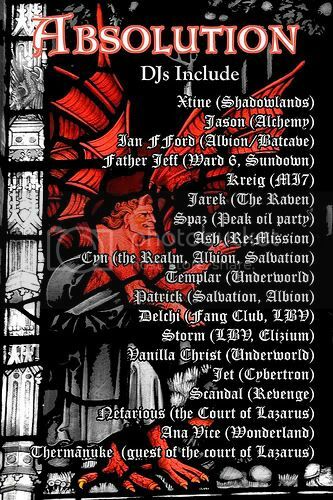 There are only four Goth/Industrial parties now being held which have any promoters who have lineage from the great old parties of 10 years ago, DefCon @ Pyramid, Ward 6 @ Le Poisson Rouge(a monthly), Contempt @ Identity(a monthly) and our ABSOLUTION. Only DefCon and ABSOLUTION have achieved the usual norm for parties, a weekly status. It's no coincidence- the promoters of old NYC have proven themselves time and time again in an environment so competitive that most would not be able to withstand the stresses. When I first came to NYC, the club scene had a feeling of security, nobility and history at each event. All that was taken away with the changing economic climate of nightlife of the recent years. Now, we hope to provide such an environment by booking DJs who represent the parties of old. For if not us, who is there who remembers? ABSOLUTION has been up and running since July 4th Weekend, and I am happy to report that our customer base is now large enough to switch from every other week to weekly. 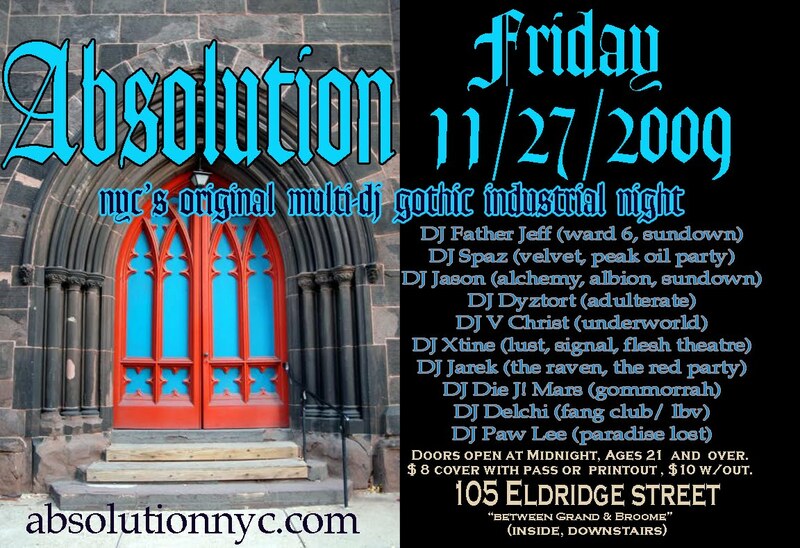 This is exciting because it will be the first weekly gothic event in Manhattan since the defunct Albion. Note- there is one other weekly event currently in Manhattan of interest to Goth/Industrial club patrons- DefCon Saturdays at The Pyramid Club which plays mostly Industrial. The main problem with going weekly for most Goth/Industrial events in Manhattan has been the lack of a venue that will allow it to operate on such a frequent schedule. After the nightlife economy in Manhattan was devastated by the twin evils of Mayor Giuliani and 9/11, it never quite recovered. I feel that this is due to Mayor Bloomberg's continuation of Giuliani's anti-nightlife policies. Therefore nightclubs in Manhattan, faced with rising rents and endless tickets, can only devote lucrative Friday and Saturday nights to topics which are guaranteed to make large amounts of money such as House, Hip-Hop(shudder), etc. This requires flexibility and creativity on the part of the Goth/Industrial promoter who would offer a weekly weekend event. 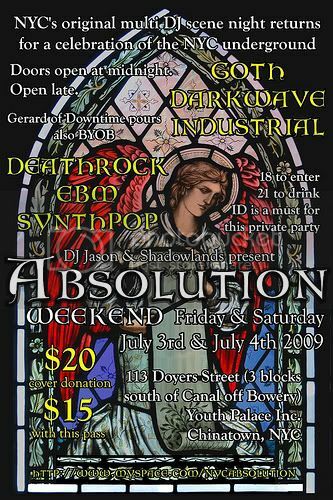 ABSOLUTION Weekend, July 3rd and 4th! Hello, All...I left the nightclub production world in 2007 after producing the party SHADOWLANDS to focus on music. But sometimes something very rare and special comes along. 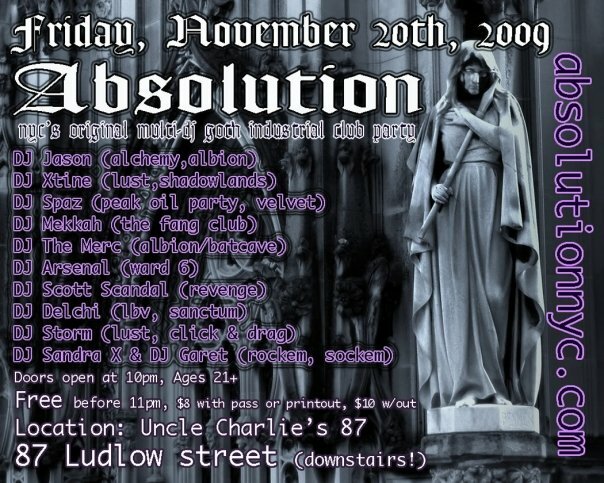 The way things have worked out, I am happy to present to all of you a party called ABSOLUTION. 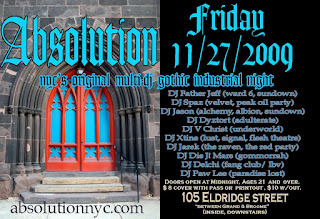 Some of you may remember it, as it has been running for the past 10 years, others may not- it's an exclusive goth/industrial party featuring the best DJs that Manhattan has to offer. Produced, or should I say curated, by DJ Jason of Alchemy, Absolution, Batcave, Mother and a whole host of other venues and parties, you will not find a party in the city of Manhattan these days to match this one in atmosphere, music and....just sheer GOTH-ness:) If you liked or even loved SHADOWLANDS, you will appreciate ABSOLUTION. I invite all of you, former and future guests, to join me on July 3rd and 4th, either one or both days, at the same space SHADOWLANDS was held in- 113 Doyers St. It will be a weekend to remember.